1) NGO Monitor reports on ‘EU Funding to NGOs Active in Anti-Israel BDS Campaigns‘. “The European Union (EU) is the single largest donor to non-governmental organizations (NGOs) active in the Arab-Israeli conflict, accounting for NIS 28.1 million in 2012-2014 to politicized Israeli NGOs alone. 2) During the summer 2014 conflict between Israel and Hamas the BBC World Service broadcast a particularly egregious interview with an ISM activist called Joe Catron who also writes for an outfit called Mint Press News. As our colleagues at CAMERA recently noted, a document that purports to be a guide to help readers discern reliable and unreliable news sites and is promoted on the Harvard University Library website includes incorrect classification of Mint Press News. Proceed With Caution (tag unreliable): Sources that may be reliable but whose contents require further verification or to be read in conjunction with other sources. Political (tag political): Sources that provide generally verifiable information in support of certain points of view or political orientations. 3) Vimeo has an interesting video of a discussion between Dave Rich and Nick Cohen at Jewish Book Week. 4) Ahead of Yom HaShoah Rabbi Sacks has produced a new video titled ‘The Mutation of Antisemitism’. Towards the end of February a fugitive Palestinian terrorist who had been hiding in the Palestinian Authority mission in Sofia, Bulgaria, died. “Bulgarian radio reported that Omar Nayef Zayed, 51, had fallen from the fourth floor of the embassy. He died later in the hospital. In 1986 Zayed was convicted in the murder of yeshiva student Eliyahu Amedi — whom he stabbed to death in Jerusalem’s Old City — along with two other Palestinian assailants. He was sentenced to life in prison. Four years after beginning his sentence, Zayed began a hunger strike and was moved to a Bethlehem hospital facility, from which he managed to escape. He fled to Bulgaria in 1994 and married a local woman with whom he had three children. In December of 2015, Israel submitted a request to Bulgarian authorities to extradite him. Late last year Bulgarian authorities agreed to examine the Israeli request but a December 14 hearing was postponed because Zayed was not at his address, the Bulgarian interior ministry said. Predictably, conspiracy theories soon sprang up. “Zayed, a member of the Popular Front for the Liberation of Palestine (PFLP), had been living in Bulgaria for the past 20 years. Even though the body bore no bullet wounds, the PFLP claimed he had been shot in the head. Almost a month later, the Bulgarian Prosecutor dismissed the claim of murder. “Bulgarian Prosecutor Sotir Tsatsarov on Monday dismissed suggestions that Omar Zayed, a Palestinian man whose dead body was found in front of the Palestinian Embassy in Sofia, might have been murdered. He told reporters that the post-mortem examination of Zayed’s body had shown no signs of violence. Prior to that announcement from the Bulgarian Prosecutor, a series of events were (and still are being) organized by a plethora of anti-Israel activists worldwide who had no need of an official investigation in order to determine what had happened to Omar Zayed – and who was to blame. For example, an Iran linked website (which has recently been in the news in the UK for other reasons) promoted the image below on its Twitter feed and held some sparsely attended events in London. The day after Zayad’s death the US-based ‘Samidoun Palestinian Prisoner Solidarity Network’ issued an appeal to members of the European Parliament in which it was claimed that Israel had murdered him and the day before that Samidoun’s New York based ‘organiser‘ Joe Catron had put out a statement in which – just hours after the event – he claimed that Zayad had been ‘assassinated’ by Israel. It was of course not in the least bit surprising to see ISM member and professional anti-Israel activist Joe Catron propelling the bandwagon of unproven defamatory smears against Israel. It is however worth remembering that on two occasions during the summer of 2014, the BBC promoted content based on claims made by Catron without making any effort to comply with its own editorial guidelines on impartiality which stipulate that the agenda and ‘standpoint’ of interviewees should be made clear to audiences. On July 31st 2014 the BBC World Service aired an interview with Catron in which he told BBC audiences that Hamas was not using Gaza hospitals for military purposes. 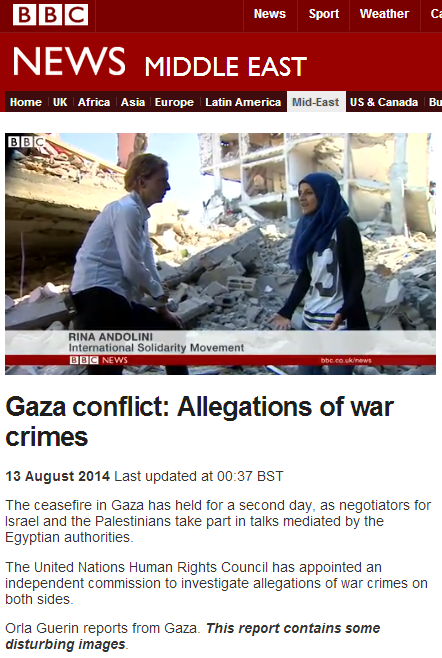 On August 13th 2014 BBC News aired a report by Orla Guerin which showcased an unsubstantiated video produced and promoted by Catron under the heading “Allegations of war crimes”. As the story above shows, it is from time to time worth reminding ourselves of the types of sources the BBC considers legitimate and the agendas which are sometimes concealed behind ‘news gathering’.